In 1991 Hans van Heeswijk's steel-and-glass art lending library was built alongside the 17th-century gateway building housing the museum De Beyerd. The two are united by a transparent intervening area containing the entrance, milling space, stairs and a lift. 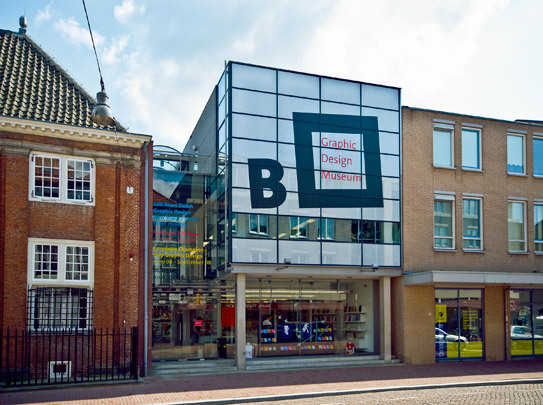 Art lending library and gateway building are now both part of the Graphic Design Museum, for which van Heeswijk designed a new portion at the rear. Like the library it is a spare, subdued space of concrete, steel and glass in neutral tints. Its two storeys contain six exhibition areas and an auditorium. In 2011 the name of the museum changed to MOTI (Museum Of The Image).